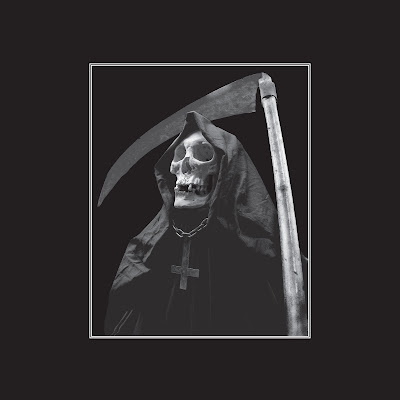 The Lair of Filth: Death Worship - End Times MLP - Press Release + Track Stream. Press Release text by C. Conrad - sent via Nathan T Birk. With its highly anticipated debut recording, 'Extermination Mass,' Death Worship emerged in 2016 to write the next chapter in the storied legacy of the Ross Bay Cult. 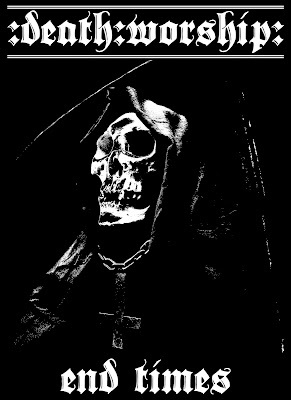 Whereas many bands over the years have striven to claim a position atop the mantle of bestial black metal, the incomparable lineage of Death Worship’s members and the pitiless assault on the feebleness of human existence as evidenced in this first recording confirmed it as one truly worthy of such a distinction. Now, approximately two years later, Death Worship returns with its second siege, 'End Times,' which ominously portends the finality to which all mankind will succumb. The perpetrators of this attack are the same as on 'Extermination Mass.' Specifically, ‘Deathlord of Abomination and War Apocalypse’ (aka R. Förster) has once again enlisted the services of J. Read on session percussion, and ‘Nocturnal Grave Desecrater and Black Winds’ eagerly offered his own legendary war commands to back those of Förster and his bludgeoning guitar and bass offenses. Although these supporting members have been directly involved in Förster’s lifelong trajectory in black metal through their joint collaborations in Conqueror and Blasphemy, Death Worship is the creative progeny of Förster himself. As he stated in an interview following the initial release of 'Extermination Mass,' this entity is best interpreted as his own brainchild moving forward in the aftermath of Conqueror’s split, at which time Read similarly forged his own unique path with Revenge. While it is clear that Förster’s involvement in Conqueror and Blasphemy contributed greatly in shaping this vision, this latter project represents a sound that Förster envisaged and a creation that he has incrementally cultivated since he first picked up a guitar decades ago. In Conqueror, the Superion was seen as a potential to rise above the weaknesses and scourge of humanity at large. In Death Worship, that glimmer of optimism is no longer present, which brings us to 'End Times.' The tangible product itself is one that reflects no superfluous experimentation with sound or alien influences from other genres. Instead, it is simply the manifestation of the most purely extreme black metal, inspired by I.N.R.I.-era Sarcófago, Blasphemy, early Beherit (and The Lord Diabolus), early Slayer, Hellhammer, and early Bathory. In order to properly achieve this goal, and in keeping with the traditions of the Ross Bay Cult, Fiasco Brothers Studio in Vancouver, Canada was chosen as the site for its audial incarnation. Given the increasingly nihilistic state of affairs into which humankind has descended, so it is written that 'End Times' shall serve as the appropriate soundtrack to its demise. 'End Times' by Death Worship will be available on vinyl and digital formats via Nuclear War Now! Productions from the 15th of February.